Add the magical flavor of Nature's Perfect Sweetener to all your favorite foods! The age-old flavor of 100% pure maple sugar is combined with the zest of black pepper to create an exciting new taste for ham, chicken, fish, game, vegetables, soups, salads and eggs. Use your imagination! The flavor of maple enhances anything it touches. 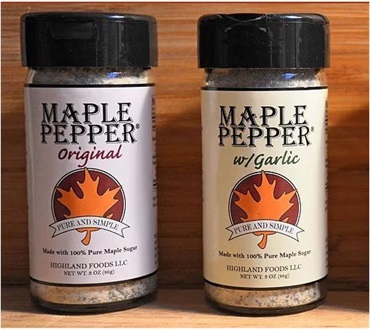 For the garlic lover in all of us, we also offer Maple Pepper with Garlic; a seasoning that will impart a richness and ineffable flavor to so many of your favorite foods. Shake it on meats, poultry and fish before and after cooking, add it to soups and stews, sprinkle it on your sandwich and so much more. When the recipe calls for pepper and garlic, why not use Maple Pepper and Garlic instead for that little something extra that only 100% pure maple can bring? This all natural, pure maple product comes from our New England neighbors to the East who are located in Newcastle, Maine; then brought to your table by Dakin Farm and our reliable shipping partners. This is my "go to" spice for everything! This is absolutely the best spice ever! It's my "go to" spice whenever I want to add a little extra something without adding calories. It goes with everything.